22/05/16 – Martin Smith points out about Amiga non-existence, so i’ve updated the page. Seems like an early one I wrote that needed a lot of fixing. More arcade conversion action from Elite in the form of Edward Randy, a interesting arcade game with a character inspired by Indiana Jones. 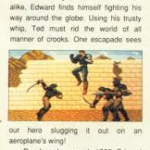 The game featured levels such as part where Edward Randy is on a wing walking on a bi-plane, and was a typical platformer which was pretty good. This as with a few other Elite titles, only got mentioned brielfly, and was then never heard of again. 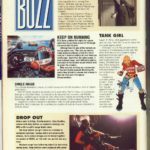 The game was also planned for the Amiga and other platforms, but nothing surfaced across all formats. We do not know how far this game got, or who was behind it… but again we hope to find out soon more about this planned conversion. Who did it?… how far did it get? At the moment we believe that the game didn’t get very far at all. Caveman Ninja was released at least on the Amiga, so its possible the 16-bit versions were started at least. 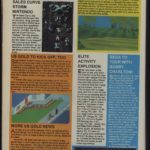 It was around the time though that Elite had moved away from the C64 completely. Don’t think there was an Amiga version, no trace of it in Hall Of Light. 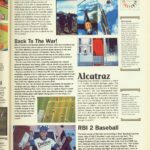 It’s put down as a Spring’92 release in Zzap 64’s The Year Ahead…feature.I’ve played the game via MAME and it’s superb, but you’d need something like the SNES/MCD/Atari Lynx or some clever coding routines on MD, to really do a home version justice.Could’nt see it working on C64 at all to be honest.